OK, so I agreed to be a guinea pig for a fellow blogger. She has an awesome site and some great workouts, and the 28 day reset seems appropriate for February. It’s real peeps – none of that lose 30 pounds in 30 day baloney (how many calories is bologna?) She guaranteed me 6-8 pounds in the 28 days if I behave. Tough call, but I am going for it! WOO HOO!! Here’s the deal, if any of you want to join me…. And…you have to commit to 28-30 minutes of exercise a day. Who’s with me? YAY! I will be doing some Blogilates, Just head to the videos, and if you’re locked into Leslie, Denise or Tony…do that. OK, Clean Eating. Great mag by the way, with very awesome recipes. So as my first good deed of the month, I’ll share a breakfast with you. High in calories, but it makes up for it in protein and it totally fills you up. AND, yup, coffee based! HOORAY FOR BREAKFAST! 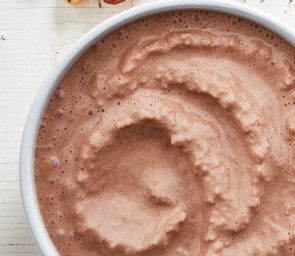 Mocha Smoothie Bowl – worth the calories if you’re clean eating and on the 28 day reset. Add all ingredients to your blender or food processor; blend until smooth. Serve with toppings of your choice.